Adolescence-in theory they were kind of sort of ok, but only when raw. Beginning of young adulthood-Likes onions in salads and is a BIG fan of scallions (aka green onions) pretty much all the time. Will eat onions in stuff (such as soup, mac n cheese, etc. etc. ), but still not into onion rings. Now-OMG onion rings are soooo yummmyyyyyyyy! 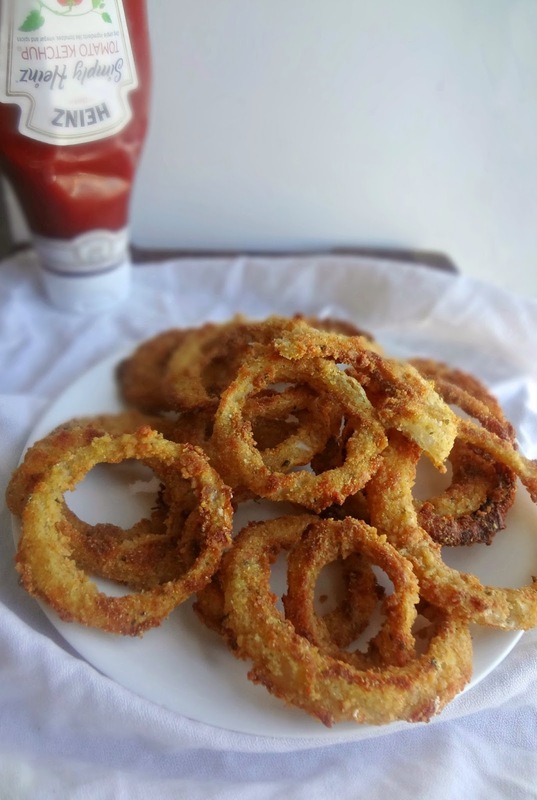 I recently hopped on the onion ring bandwagon (as my earlier list shows) and I find I especially love crisp onion rings made with Vidalia/sweet onions. Because....mmmm just SO good! But...onion rings are fried. Therefore....not something that I was too happy that I've begun to like. Because my waistline does not need me to suddenly add a new fun food to my diet that's bad for me. BUT this recipe saves everything! It's ok! It's ok that I like onion rings! These onion rings, however, are MUCH more than just ok. I was so scared making these, because Michael tends to scoff at any recipes that try to healthify a beloved food (he LOVES onion rings). But my worries were unfounded because he looooved them! They are so crispy, so flavorful, there's seriously nothing not amazing about them! You'll never believe that they are baked not fried! I mean...maybe you will believe it, but you will not miss the fried ones because these are just sooooo good. Agh I could just squeal and talk about the tastiness forever, but....why don't you just see for yourself? MAKE EM. Peel onions and cut into 1/2 in. slices, being careful to keep rings intact. Then, pop each layer of each onion slice out to form the rings. 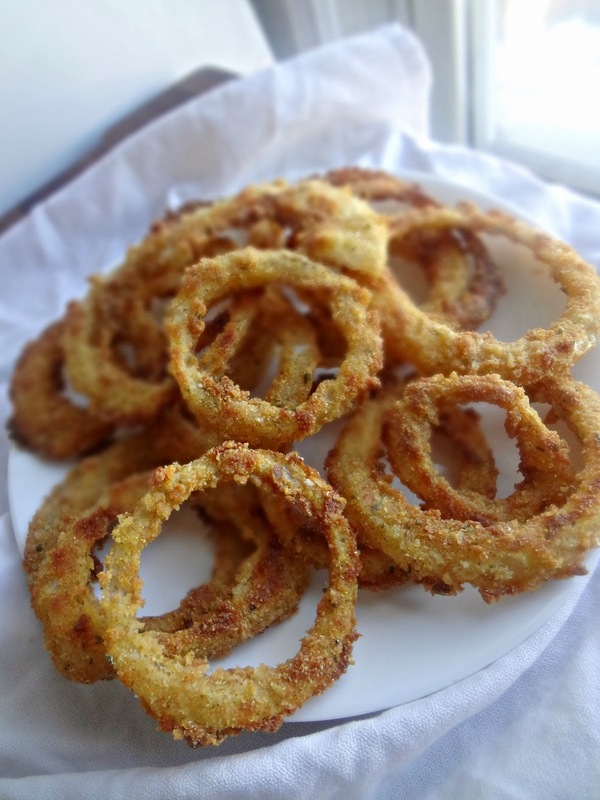 Place onion rings in a dish and pour in buttermilk-don't need to completely cover the rings but make sure they're at least partially submerged. Cover and refrigerate for at least 4-12 hours, or up to 2 days. Preheat oven to 425F degrees. Line baking sheet(s) (you can either line 2 sheets or do it in 2 batches using the same sheet) with parchment paper or silicone baking mat. In a medium bowl, beat egg whites with a fork. Combine flour, breadcrumbs, cornmeal, and seasonings in a large, shallow dish. 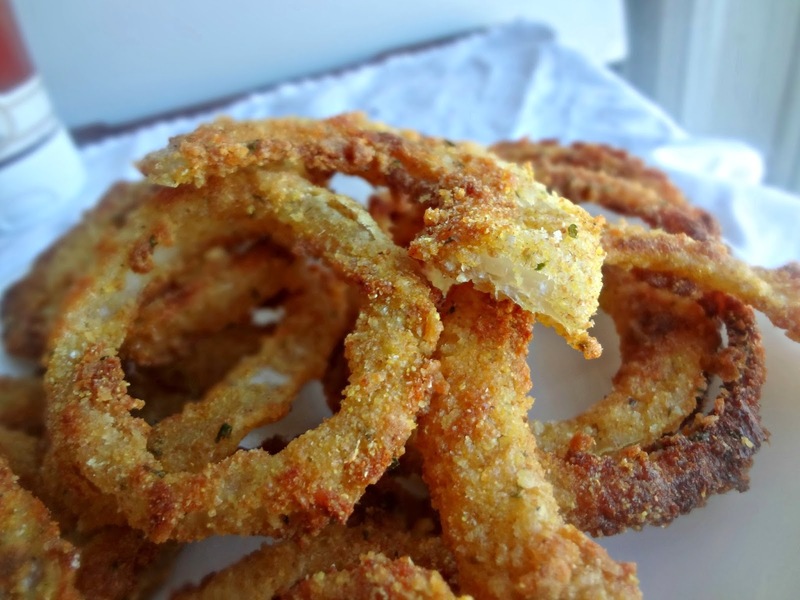 Remove soaked onion rings from the refrigerator. Take each ring out of the buttermilk and dip in the egg whites, then coat in the crumbs mixture. (If the crumbs aren't sticking, dip back in the egg whites and then try again.) --If you run out of the crumb mixture, mix more up. Place coated rings on baking sheet(s) in a single layer. Spray each lightly with the oil spray to seal the breading. Bake 10-15 minutes (15 minutes if the pan is full and the rings are large). Remove and flip each ring over, spraying with the oil again. Bake 10-15 more minutes, or until browned and crisped to your preference. 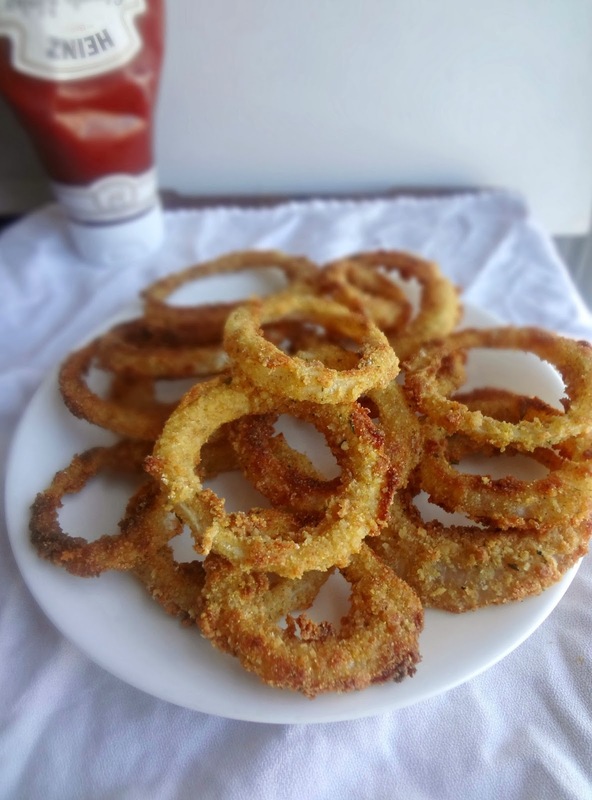 Let finished onion rings sit for 10 minutes, then enjoy immediately! Store any leftovers in a covered container in the refrigerator, and then reheat in the oven for optimal crispness. Disclaimer: Be VERY careful when slicing your onions-especially when dealing with large ones it can be very tricky, and no onion ring is worth a sliced finger! So be cautious!